Welcome to a “Flashback Frightday!” We’re still going strong with our haunt retro reviews, and in speaking of retro, today, we have a home haunt that really draws its aesthetic and inspiration from the gritty “old school” haunted attractions that we used to see 10 or 20 years ago. Twisted Dreams Haunt is the name of our destination. Located mere minutes west of Knott’s Berry Farm, this home haunt showcases the influence that the original Halloween Haunt had on its owner, Leif Swenson, when he was growing up just a few blocks away. Back then, haunted house attractions generally followed a gory slasher aesthetic, with plenty of disembodied victims, body parts, and blood-soaked props and scenery. Things were rougher and grittier, with an emphasis on the scares much heavier than today’s story-centric approach that weights scares and scenery evenly. 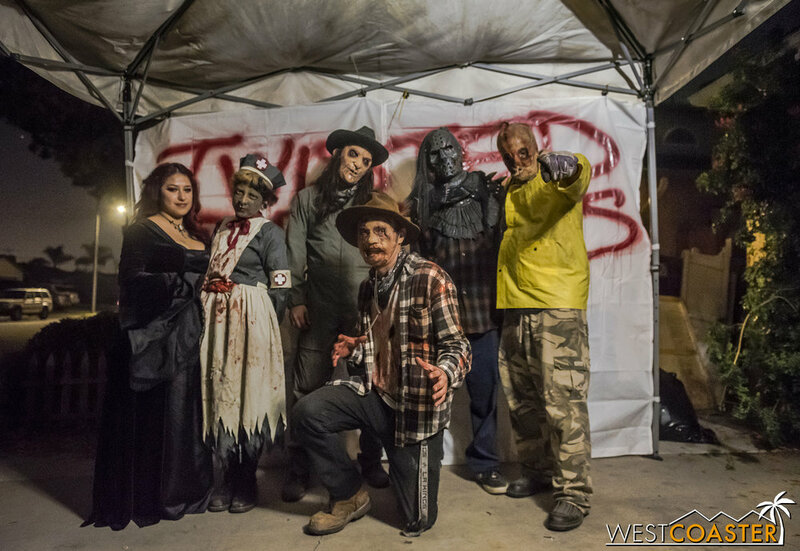 Guests are bound to meet a whole host of hostile ghouls in Twisted Dreams Haunt. An unfortunate victim befalls her fate. Twisted Dreams Haunt won’t win any slick beauty pageant awards, but it does pay homage to that traditional style of maze very closely with a sprawling layout around the Swenson property that is chock full of monsters and carnage. 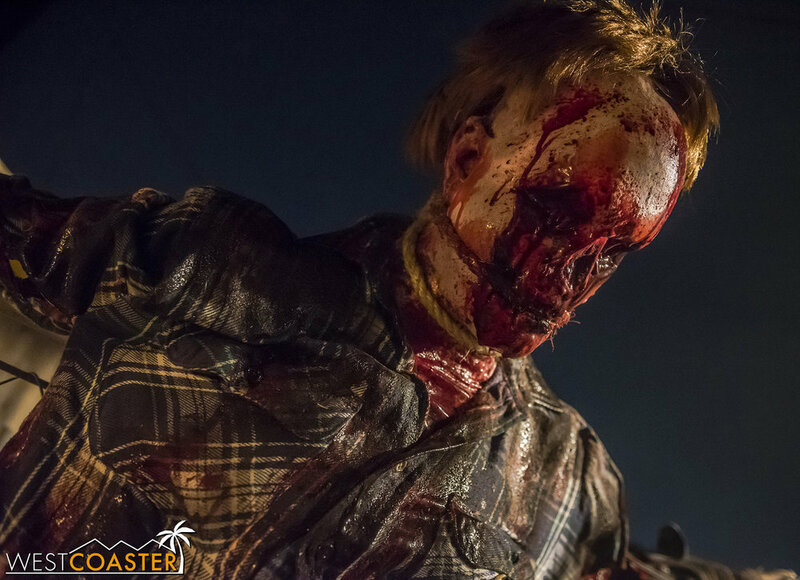 Guests arriving find a hearse parked on the front lawn and a simple pop-up tent with the name of the haunt scrawled in blood-soaked letters. Admission comes in the form of a $5 donation, and after making one’s way through the side yard, the experience begins. Everyone is out to getcha at Twisted Dreams. The theme of Twisted Dreams involves a murderous conductor who headed a violent cult that murdered and dismembered those who crossed it, transporting the body parts across the country via a shipping railroad to hide its gruesome deeds. As such, there is plenty evidence of murder and mayhem when working through this haunt. A trough of limbs, hanging corpses, and even a prisoner or two waiting to be slaughtered are common sights. The lighting is moody and tense—a mixture of strobes and warm, tinted colors. The layout has been designed to offer diversity of scares. There are hiding spots and pass-through’s and staging areas that can be utilized across multiple rounds, enabling a monster to jump out from different positions and vary up the scare. The actors make great use of the space, relentlessly targeting guests and sometimes working together to showcase a theater of bloodshed and horror. They’re an unruly gang, looking far from glamorous, and they maintain a great amount of energy throughout the entire course, especially when they smell the fear on a guest. All the while, the scenes grow more disturbing as the true terror of the Great Sierra Western plays out. The experience culminates in a graphic and disgusting visual feast of the mutilation that leaves guests barely able to squeeze out an escape! Chainsaws? Yep, Twisted Dreams has ‘em! The torture continues throughout the maze. Twisted Dreams Haunt is a reflection of Leif’s love of haunting, which came at an early age. When he was a child, he and his father would create scary haunted houses for Halloween in their family home. He loved going to nearby Knott’s Scary Farm as a teen, reveling in the horrific atmospheres and mazes that they unleashed upon their guests year after year. These days, he carries on the tradition with his own family. His kids help out and even scare in the maze, and even the less Halloween enthused among them have grown to enjoy this annual tradition. He also enjoys the support of a tight network of friends who have helped with Twisted Dreams for years, some of whom he’s known since childhood, and at least one who actually went to one of his haunted houses as a child before becoming friends with him later in life. That type of bond really shows in the chemistry and rapport the cast seems to have. And all of this comes together in a home haunt that shows a lot of passion and spirit! All of this works up a good appetite. Perhaps guests can stay for dinner? 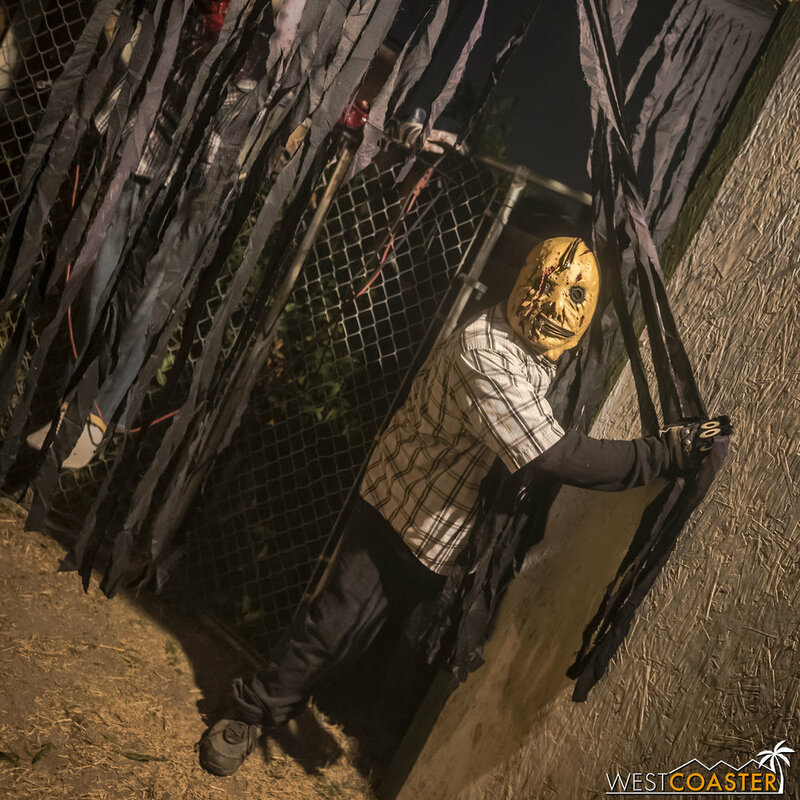 Twisted Dreams Haunt is located on 5815 Panama Dr, Buena Park, CA 90620 and was open this last Saturday and Sunday plus Halloween Eve and Halloween night of this past October. It was definitely one of the more intense home haunts of the season, focused on inflicting terror as its primary objective. It’s one of a few haunts in this general area that are open the last weekend of the month, and it’s certainly liable to give anyone who visits it some pretty unhinged sleep to suit its name!